There are few ways to upgrade your subscription type on Roundme. You are advised to become 'Pro' if you reach the weekly limit or perform any other action which requires 'Pro account' to work. You can manage your subscription and paid tour upgrades in the 'Upgrades' section of your Roundme settings. 5) Click 'Have a coupon? Click here to enter it' option to use a discount coupon. If the coupon you enter is valid, you will see the updated amount on the button below. 6) Click the button to proceed with the purchase. Auto renewal option helps you to keep your 'Pro account' subscription active. Switch it on and your subscription will be renewed automatically when expired. Please note, that this feature is switched on by default. 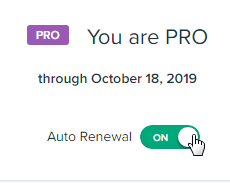 If you don't plan to renew your 'Pro account' subscription, simply switch the auto renewal option off.